Yesterday it felt like the entire custom world was in Yokohama, Japan, for the famous Mooneyes show. 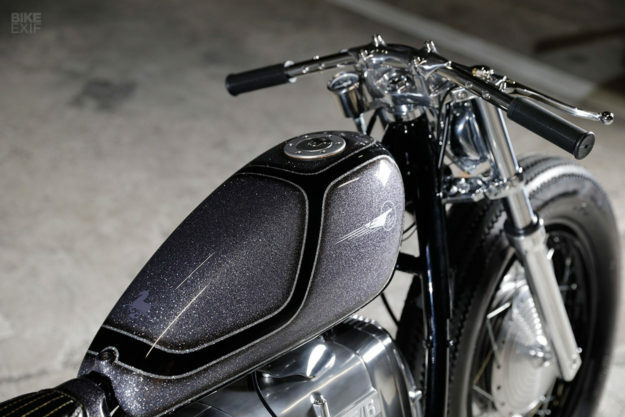 Officially called the ‘Hot Rod Custom Show,’ it’s a one-day, nine-hour spectacle that draws the best customizers from all corners of the Land of the Rising Sun—and many from other continents, too. 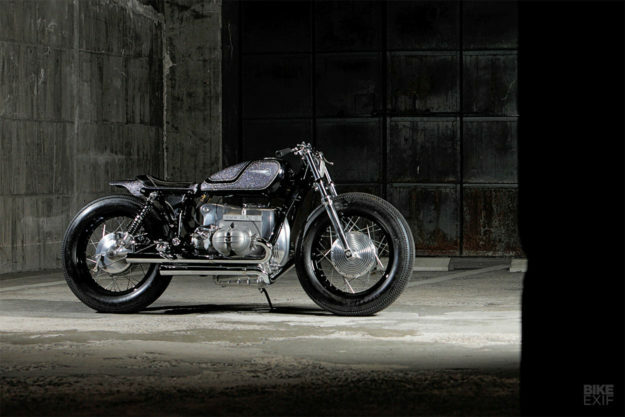 Most of the top builders reveal a new bike at Mooneyes, including Kengo Kimura of the acclaimed Hiroshima workshop Heiwa. 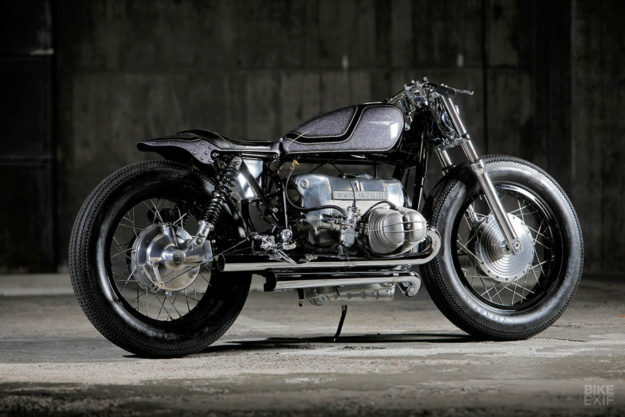 This year, he unveiled this sparkling BMW R75/6, stripped to the bare bones and transformed into pure mechanical art. Heiwa is one of the harder Japanese builders to pigeonhole: Kimura-san does not have a distinct visual signature in the way that Brat Style does, for example. 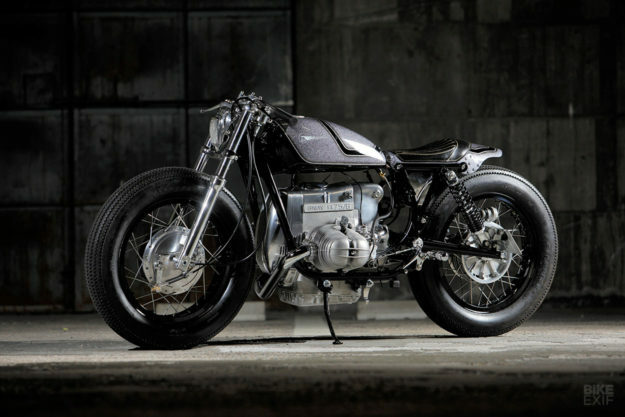 The R75 boxer engine is the centerpiece of this build, polished and slung low in the heavily modified frame. Even after all these years, it’s still a striking looking motor, and Kimura’s design gives it plenty of space to breathe. 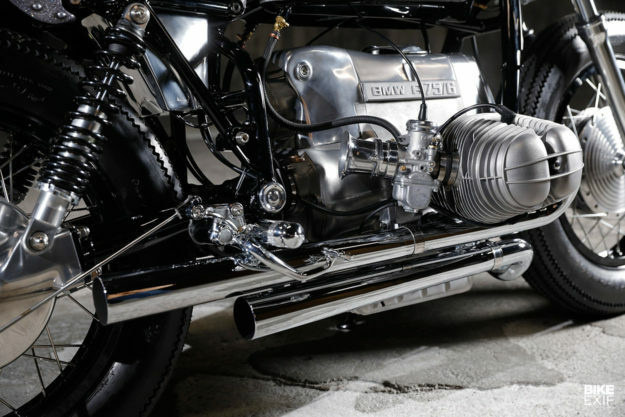 After stripping down and overhauling the 42-year-old engine and carburetors, Kimura made new trumpet air intakes and straight-shot exhaust pipes fashioned out of stainless steel. The original airbox, now redundant, has been recreated as a battery holder. It hides a tiny lithium ion battery, with the ignition coil now living in another custom-made box underneath the seat. Kimura then ditched the R75/6 forks and installed a vintage Kawasaki/KYB front end, complete with drum brake and a stunning re-machined hub. 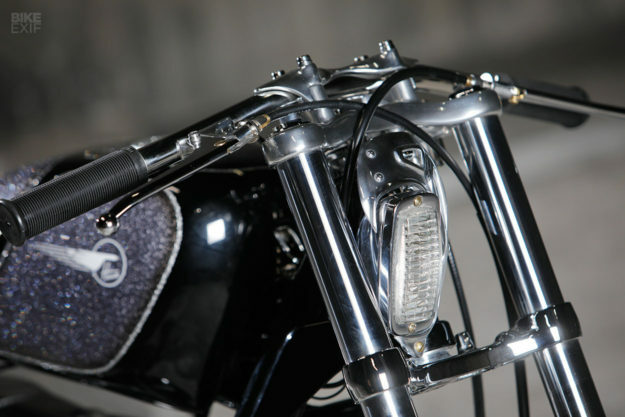 The triple trees are Kawasaki items too, topped with one-off machined risers and bars. Kimura is coy about his sources and the engineering involved—and the language barrier doesn’t help either—but the effect is beautiful. 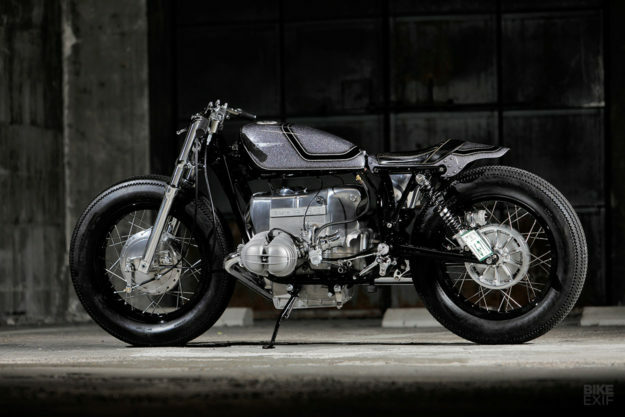 There are many contrived concoctions at the Mooneyes show, but Kimura has kept the bodywork on his BMW simple and elegant. He’s built the new tank out of steel, and the tail unit out of aluminum. 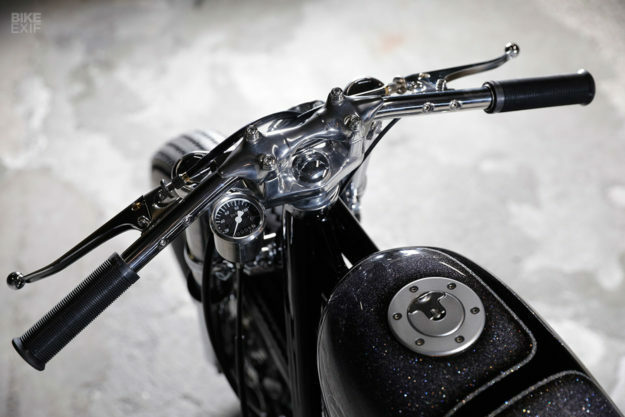 There are one-off parts everywhere, from the bars to the seat to the lathe-machined pegs. There’s even a tiny little cowl atop the headlight, which is a vintage foglight imported from the US. The R75/6 now rolls on equal size 18-inch wheels with classic H-pattern rims, shod with Firestone Deluxe tires—still the enduring choice of most Japanese custom builders, simply because nothing else comes close to that fine sawtooth tread pattern. 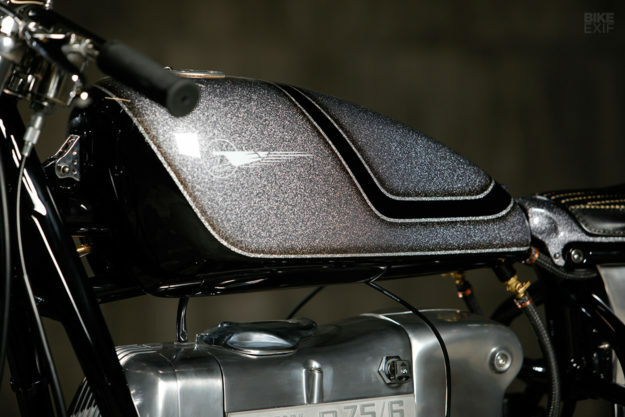 The purple candy flake paint was shot by Heiwa’s regular spray gun collaborator, Six Shooter. It’s some of the thickest flake we’ve seen; there’s so much glitter, you’d expect it to be rough to the touch. But of course it’s as smooth as silk. And proof, perhaps, that all that glitters is sometimes gold.